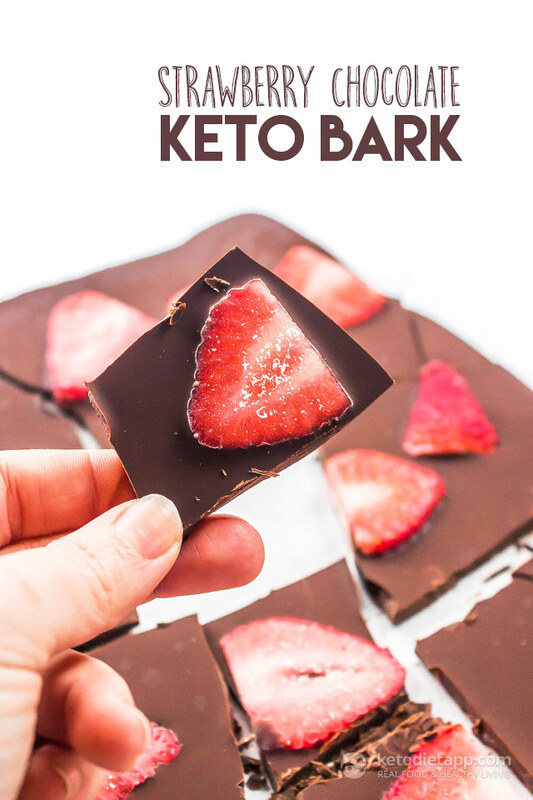 This keto strawberry chocolate bark is a great low-carb dessert for Valentine’s Day! With just 3 ingredients this healthy fat bomb is an easy dessert that’s ready in no-time. I like to keep our bark in the freezer and pull it out just a few minutes before eating to let it soften just a bit. I used fresh strawberries here but you could also use frozen sliced strawberries or even raspberries! Just be sure to re-calculate the macros if you choose to use a different fruit. 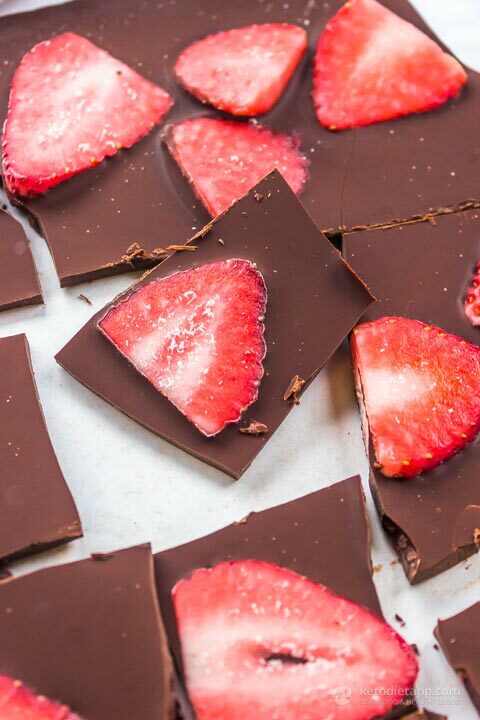 Note: You should use at least 85% dark chocolate (less than than will be too high in carbs), or even 100% unsweetened dark chocolate and add a few drops of stevia or skip the sweetener altogether. Combine the chocolate chips with the coconut oil in a microwave safe bowl and microwave in 1 minute increments until melted and smooth. 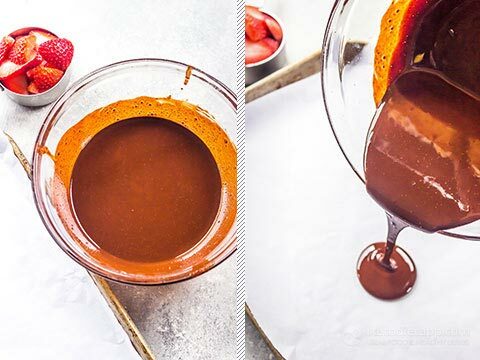 Alternatively, melt the dark chocolate in a double boiler or a glass bowl on top of a small saucepan filled with a cup of water over a medium heat. 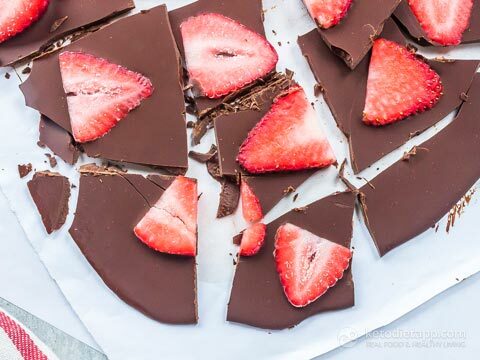 Pour the chocolate mixture on a baking sheet lined with parchment or wax paper. 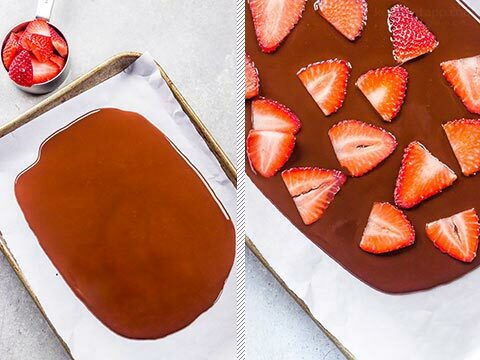 Top with sliced strawberries then transfer to the freezer for one hour until set. 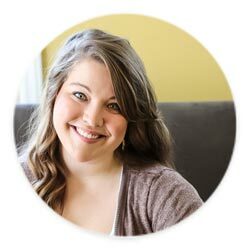 Store in an airtight container in the freezer for up to one month.